“All eyes were on us,” said Dan Einwechter, chairman and CEO of Challenger. To handle the move, Challenger used 2011-model wide-hood Kenworth T800s with 72-inch AeroCab(R) VIT sleepers with diamond interiors. They’re spec’d with tandem and tri-drives, each equipped with 600-hp Cummins ISX15 engines, driven through 18-speed transmissions (the tri-drive also has a 4-speed auxiliary transmission). 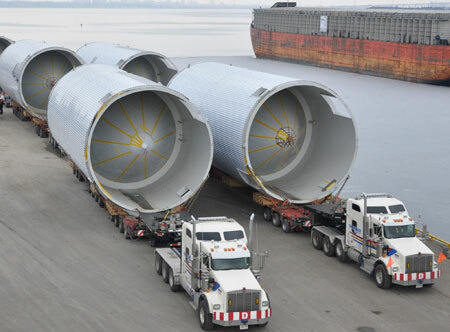 The T800s feature 20,000-pound Dana front axles, 52,000-pound rear axles on the tandem units, 60,000-pound rear axles on the tridems, and 1,780 square-inch cooling modules. 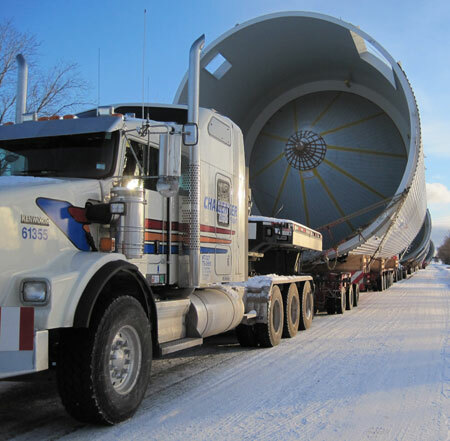 Challenger partnered with Mammoet and Don Anderson Haulage to provide hydraulic trailers, the largest at 70 feet in length with 102 wheels. Each T800’s gross combination weight during the move was 250,000 pounds. According to Einwechter, pre-planning involved carefully assessing maps to plan the best route, driving that route in cars for additional information, and then driving the route in trucks to ensure clearance around corners and other tight areas. “It was an exhaustive process,” recalled Einwechter. Nor was it easy making headway. A work crew of more than 80 people was on-site each night. More than 2,000 wires had to be taken down and fiber optics (which can’t be cut), had to be pulled. Then the wire and fiber optics had to go under a special ramp so the convoy could drive over them. As the convoy closed in on the brewery, the amount of wires increased and the 7-kilometer (4.2-mile) leg took 9 hours to complete. All told, the 108-kilometer run took 81 hours to move. For those doing the math, that’s 1.3 kilometers per hour. “There was a great sense of relief and an immense amount of pride when we made our final stop at the Molson brewery,” said Einwechter. “We’re glad the project was safely over. Our Kenworth T800s and the trailers performed flawlessly, as did our people. It was just a matter of being patient while the route was cleared of wires and obstacles. We heard throughout the move by bystanders how they couldn’t believe how well all the participants worked together. We were professional, and yet had fun with a high level of camaraderie.